Step on down into your vacation dream. 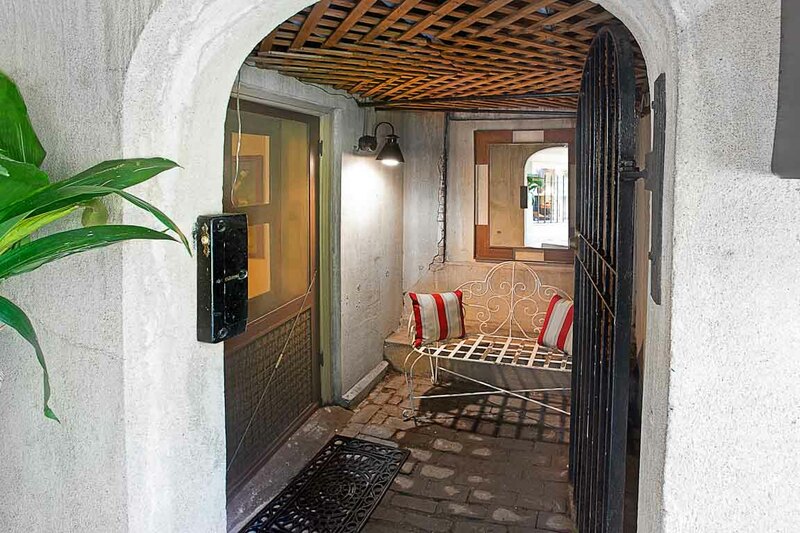 The cute front alcove to the home. Welcome to Gaston Garden Apartment! Office space to work from home just off the living room. The view from the hallway. Plush leather seating is awaiting your afternoon nap. View of the living room peering into the front entrance. The dining area is open to the living area. Have dinner with one another in the open dining area. Cute kitchen stocked with pots, pans and anything else you could need. Whip up a family meal in the kitchen. Front view of the well-equipped kitchen. Jump into this serene king size bed for sweet dreams. Lots of closet space to put away clothing and a flat screen television. Convenient bathroom with a vanity to get ready for the night. Quench your thirst with a cocktail in the warm Savannah weather. 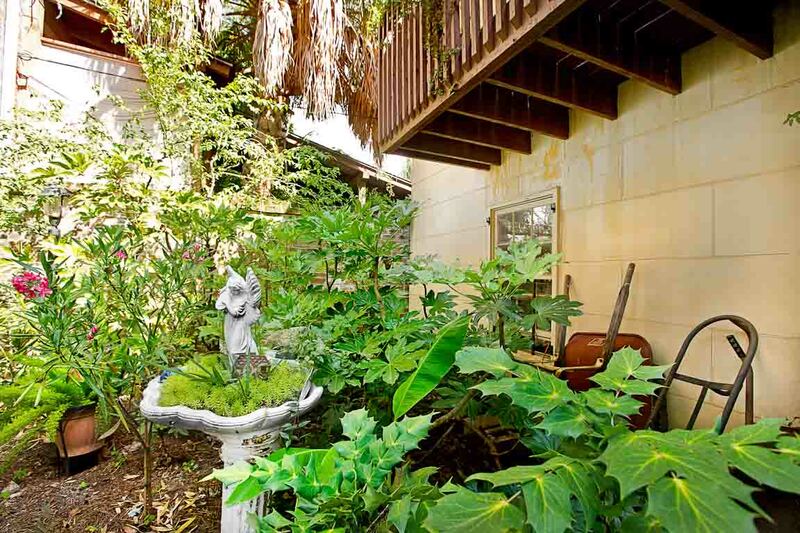 The lush gardens out back provide the peace you are looking for. Garden View into the back of the home. Hidden outdoor area to relax with friends. 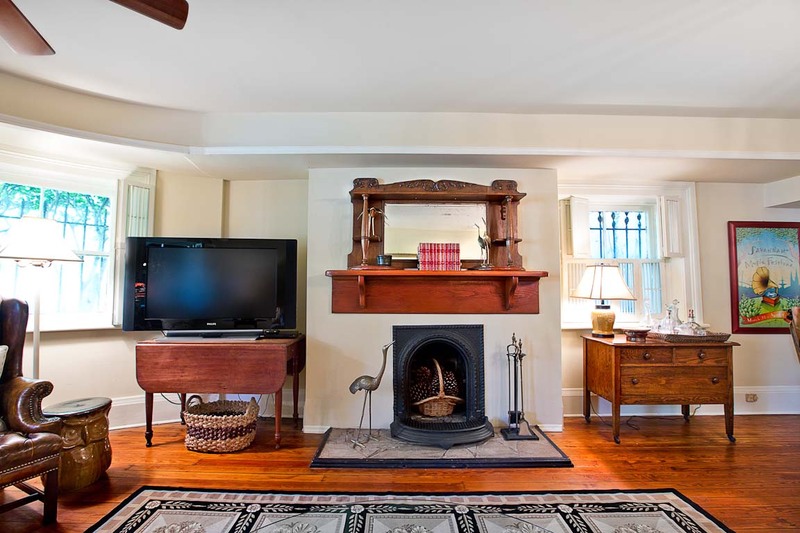 This charming, one-bedroom, one-bath ground level apartment dates back to the 1860s. Comfortable furnishings with a traditional flair will have you “living like a local” on the Historic District’s famous Gaston Street. Located just a block away from beautiful Forsyth Park, this oversized apartment is the perfect retreat for two Lucky guests. 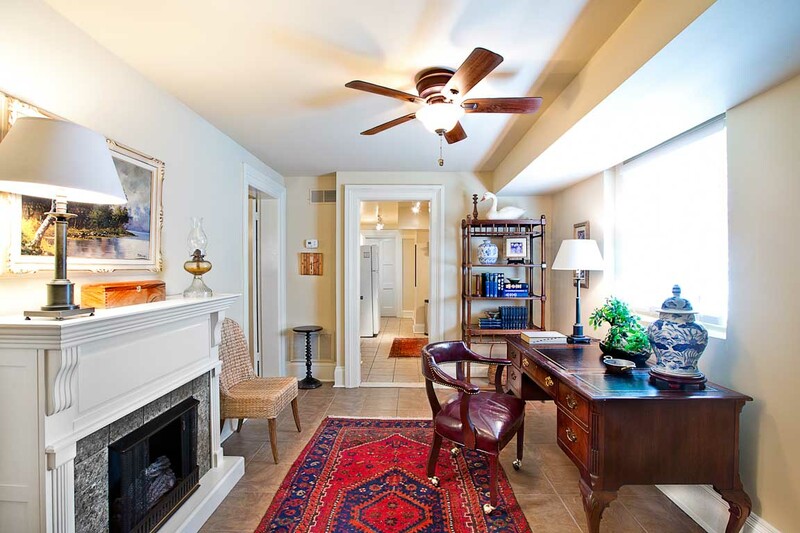 You’ll step down into your vacation home and enter in the bright foyer, with a large, decorative fireplace and beautiful desk allowing the space to double as an office. 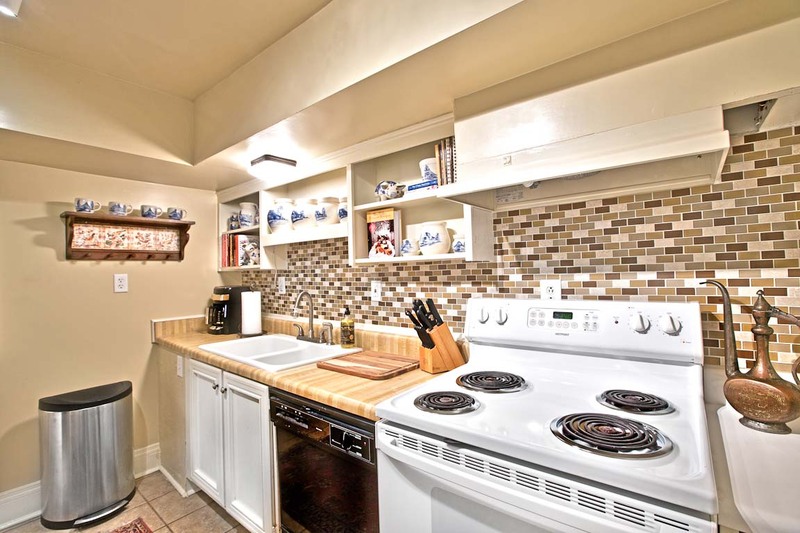 Straight ahead is the fully equipped kitchen, so you can enjoy breakfast from the comfort of your home-away-from-home. The dining area is open to the large living area, which has lots of natural light, a comfortable couch, two leather chairs, and a large flat-screen TV. 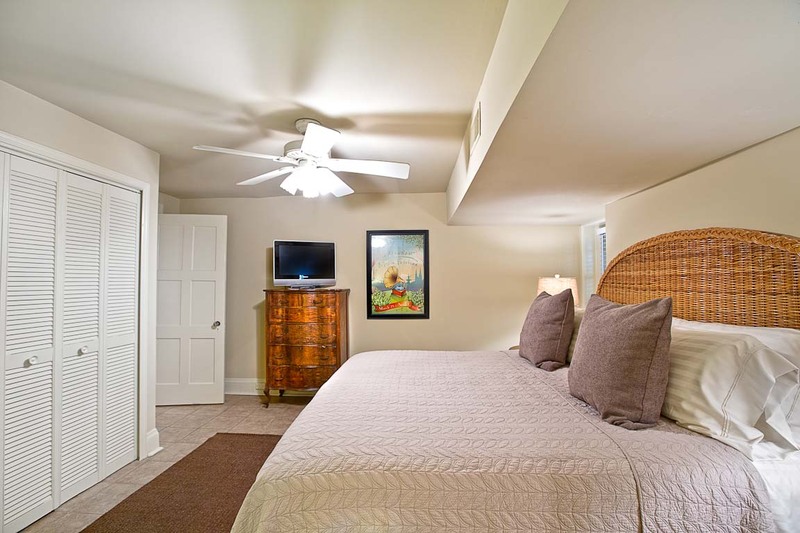 The bedroom has a king bed, TV, and lots of closet space so you can settle in during your stay. 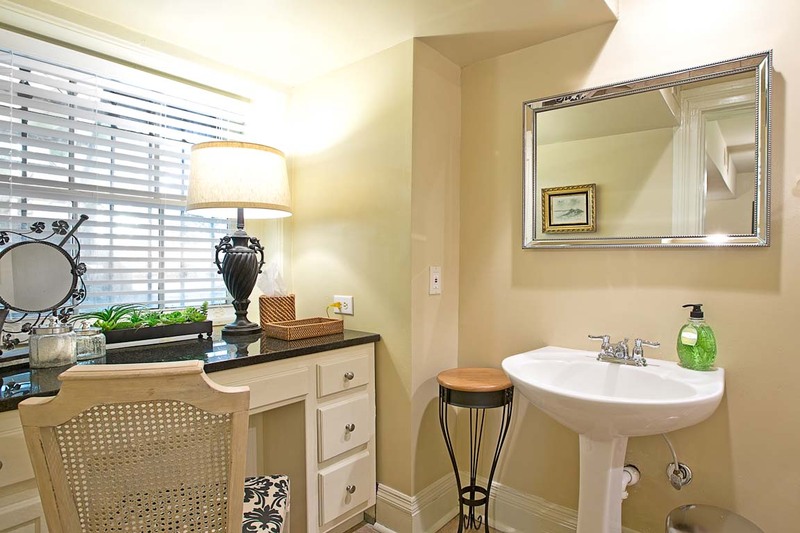 The bathroom has a shower/tub combo, pedestal sink, and a lovely vanity where you can get ready for a night out on the town. Savannah’s top eateries, including 700 Drayton and Clary’s, are all within a five-minute walk from Gaston Garden Apartment. Spend some time browsing the antiques at Alex Raskin’s, or tour the famous Mercer-Williams House on nearby Monterey Square. Get a taste of eating local by picking up fresh ingredients at the Farmer’s Market on Saturdays in Forsyth Park. - Enjoy an evening cocktail in the courtyard. - You’ll be just a short stroll from the only full-size grocery downtown, or you can let us do your shopping for you with our concierge services. 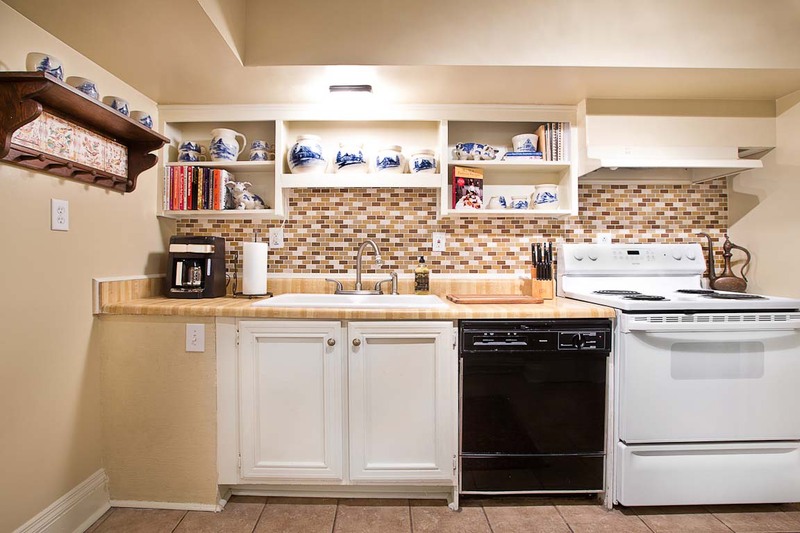 - This rental includes a washer/dryer, cable television and wireless Internet. Nice house, love the history. Clean and had everthing we needed. Great location! This place is in the perfect location for walking almost everywhere you would want to go. Very clean and well kept, we were truly impressed. The only complaint we had was the bedroom TV not working. Outside of that, we couldn't have been happier. This was our first time in Savannah and we chose this apartment for its convenient walking distance to everything. The apartment was clean and spacious. Staying in such a historic home was unique. We met Marcia and Emily and they were pleasant and wanted to make sure we were comfortable. We had a slight issue with check in but it was resolved quickly. The parking situation is very difficult and we got 1 parking citation. Overall I would highly recommend this property. Wonderful time. Excellent location to see all the best that Savannah has to offer in comfortable extremely well equipped basement apartment. Nice place and great location. Loved the district. My daughter and I had a wonderful stay at this cottage garden, we were in the perfect location down the street from forsynth Park. We were quite comfortable at the apartment it was spacious enough for the two of us and the full kitchen allowed us to have some meals at home rather then spend money on B/L/D every day, that was great savings for me. The washer and dryer also came in very handy half way through our week and we washed ball our clothes before we left, no laundry to do coming home. The living room was comfortable to hang out and watch tv at the end of the day, and there is also a tv in the bedroom. As a single mom traveling with my daughter I also appreciated the way the first iron gate was locked behind us and there was an electronic code to get in our door, once in I felt safe. When we first arrived we struggled with getting the key pad on the gate door to open. We tried the passcode repeatedly over about 15 minutes. We called the office for assistance. The representative was friendly but unable to help online. Eventually the key box opened so we could acces the key to the gate door lock. The key lock box was also difficult to close once we accessed the key. We had the same struggle to open the key box when we left and needed to return the gate key. I think the key box needs to be replaced. The house itself was cozy, friendly and clean. It is located just a couple of minutes from Forsyth Park. Although within walking distance to the Savannah action (15-20 minute walk) we found taking the free fare city bus to our preferred destination worked best for us. Once to the destination we could walk at a more leisurely pace and stop to view our surroundings. We slept great in the king size bed. It was very comfortable. However, we had a problem with the fitted sheet. It wouldn’t stay tucked so was a little annoying. We used the washer and dryer which was convenient and worked well. Good water pressure in the shower. Good internet and cable connections. We could see the House garden through the window and from the exterior grounds. However we couldn’t access it. A key was left in the house labeled as garden gate key but the key wouldn’t open the garden gate. Not sure what that was all about. The representative came by with some extra keys but none of those worked either. But it wasn’t a big loss. Most of our outdoor time was not spent at the house. Even with these couple of inconveniences I would definitely use the rental again and suggest it to others. The place was perfect for us. Close to The city historic sites . It was supplied with everything to make us feel at home. The only negative is that it needs a good clean up, It was very dusty and musty. Fantastic hospitality and beautifully decorated apartment. Really brought the character of this beautiful city inside. It was like a trip back in time. Thank you s ok much for sharing your home. My apartment was cozy and centrally located. Loved this place! Gaston Garden is a lovely little spot for a visit to Savannah. It was close to everything - we loved it. Will definitely go back! This is my second time renting from Lucky Savannah and this property did not disappoint. Staying in Historic Savannah is such a beautiful experience. 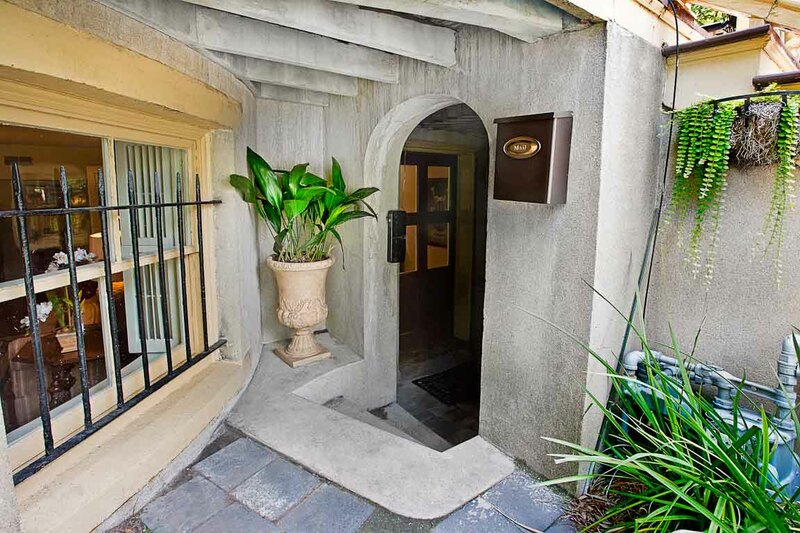 This property was on a lovely street and steps from the park. The basement apartment was cozy and charming. We definitely enjoyed our stay! 1.The property management company didn't tell us the code to the lock-box for the gate until we got there and called. There are 2 numbers you need to get inside. 2.The place is very clean and includes everything you need to cook. Only seasoning in the kitchen is salt and pepper. 5. Most Ubers are about $6 to main streets further downtown. Its really a 10 minute walk if the weathers nice. Location is quite and quaint. No problems of security and very quiet. Generally a really good place to stay. Large apartment. Very clean and quite. The bed was comfortable and plenty of hot water in the shower. One safety problem in the bedroom where the electric outlet was hanging out of the wall. A couple of small issues..., no ice tray in the freezer, and a broken closet door. But very close to walking all of the historic district and a Krogers very near by. The customer service was fast and helpful with a small issue on the door code. Hi Bill! Thanks again for choosing Lucky Savannah. We're so happy to hear that you enjoyed your stay at Gaston Garden Apartment, and appreciate the constructive feedback. We hope to host you again soon! My husband and I stayed at this garden apartment for 5 nights. Even though we were only there in the morning and late evenings, I would not hesitate to stay there again, and we have every intention of returning. The apartment is adorable and very inviting. It is in the perfect location. It's close to the park in a quiet more residential area, while still being an easy walk to almost anywhere. There are tons of pamphlets on the entryway table that has info on anything you could possibly want to know more about. The bedroom is still pretty dark into the late morning if you prefer to sleep in a little on vacation. The area seemed very safe even at night, so you can do the late night hearse or ghost tours and not worry about walking home too late. Which is also where being able to sleep in came in handy. We could hear people occasionally moving around on the floor above us, but never heard voices. Privacy was never an issue. Parking is metered directly beside the residence. On the other side of that same street was non-metered and seemed to be a more popular place to park. We did the all day passes at the visitor center. Parking was never an issue. A few caveats, by no means a deal breaker for us. The bed is quite soft. If you are use to a firm mattress or high density memory foam it can be hard on your back. The ceiling fan in the master is very low and easy to hit your head on if very tall or even changing too close to the fan. You will need the fan too because it gets warm in the bedroom. Again, very minor issues. The residence was otherwise great, and Lucky Savannah was wonderful as well. The apartment is not super sleek snd modern, but if that's your thing, you just came to the wrong city. We loved it. Mary, thank you again for choosing to stay with us and for your kind words regarding your recent stay at Gaston Garden Apartment. We're beyond thrilled to hear of your pleasant stay, and eagerly await your return. Everything was wonderful, great apartment, just locked out of the patio and garden area which we were really not happy about. Hi Jodie! Thank you again for choosing Lucky Savannah. We do apologize for the gate issue during your stay, and do hope you'll allow us another opportunity to host you now that this has been resolved! Wonderful place, fantastic area, nicely appointed and decorated. Walked everywhere. So glad to hear you call Savannah and Gaston Garden Apartment your happy place! We look forward to hosting you again soon. 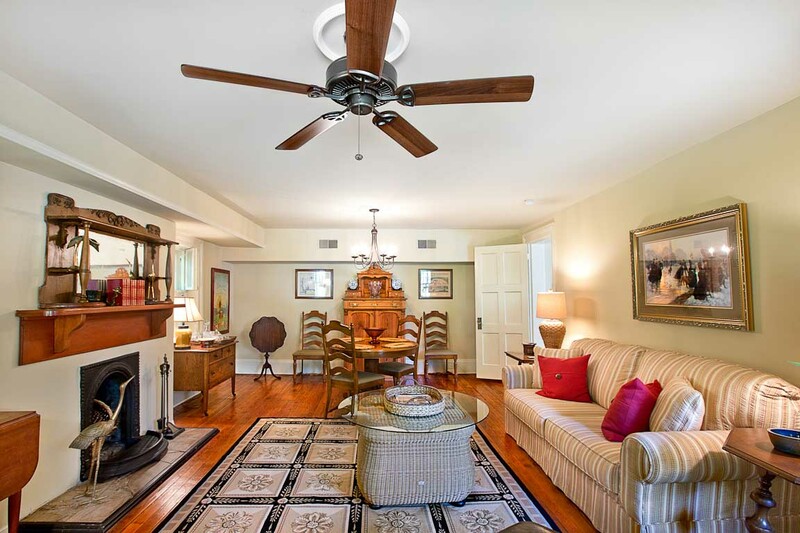 Excellent location in the Historic District by Forsythe Park. Close to local hotspots and tourist spots. We stayed here for 3 nights and had a wonderful time. The property was amazing. Everything was setup and just what we needed. When we come back, we're going to try and stay in this same property. Cory, thanks again for booking with Lucky Savannah! We're so glad to hear that you had a perfect stay at Gaston Garden Apartment and look forward to hosting you again soon! Thank you for choosing Lucky Savannah, David! We thought the apartment had a lot of character and we enjoyed our stay. It had all the essential items we needed and it was in a nice quiet area. You do have to pay attention to the parking signs, but we never had a problem finding a space. A suggestion we have is it could really use a full length mirror. The small bathroom mirror is not quite sufficient. Some of the towels and washcloths were pretty rough and could be replaced. Overall a great stay! Hi Thanks again for choosing Lucky Savannah. We're so glad to hear that you enjoyed your stay and look forward to hosting you again soon! Rental is located in a beautiful historic neighborhood. Close to Forsyth Park. Beautiful area to walk around. Very comfortable bed. We were in a great area. Charming and cozy place which was close to everything! We were able to walk to everything! The”dot”, Savannah ‘s free trolley was a block away, if we needed it! Plenty of neighborhood restaurants for breakfast, Clary’s and Dagger and Fork were delicious! The location was great! The bed was comfortable and the kitchen had everything we needed. The living room furniture was very soft and difficult to sit in. We could have used better lighting to read and do some paper work. There was some confusion checking in and were not notified so waited until after 4. We were in town all day. We were able to park on the street with a pass. A great idea. 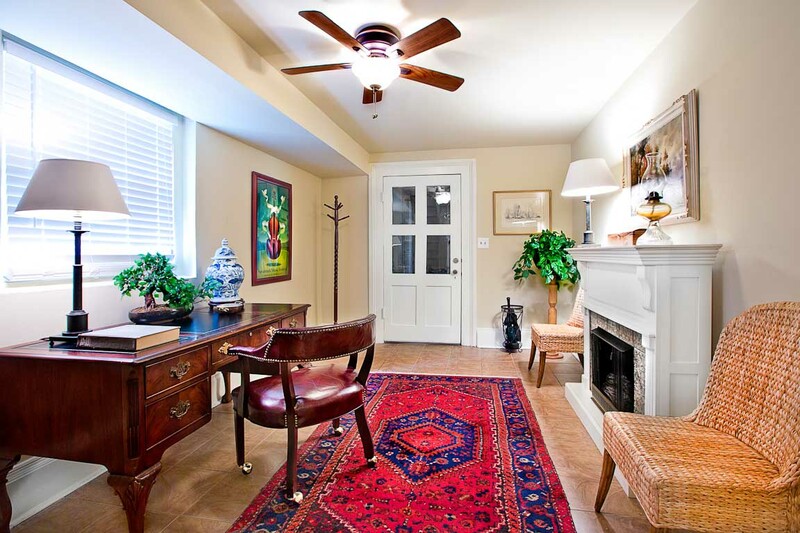 This apartment was the perfect location for us first-timers in Savannah without a rental car. 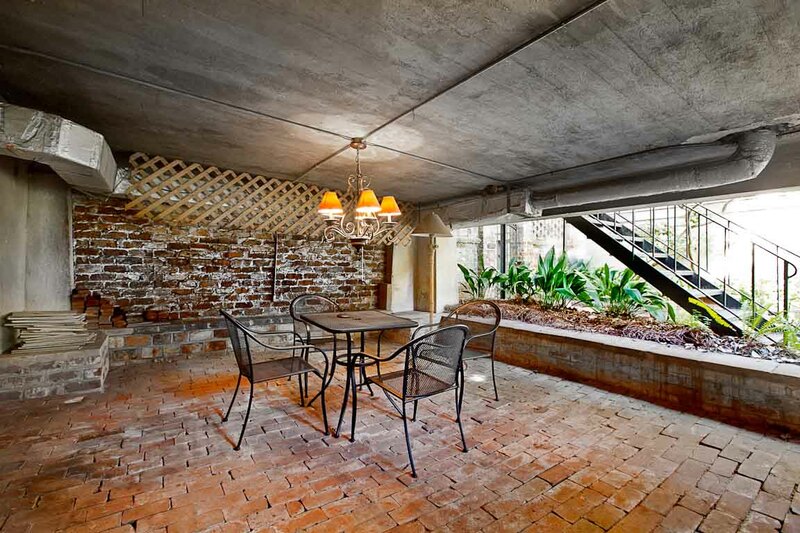 A block to Forsyth Park, and a block to the Kroger Market, and walking distance to almost all of Historical Savannah. The bed was comfy, the sofa comfy, everything worked as expected, plenty of hot water, no internet issues, and no issues with the lockbox and keypad for entrance. All utensils to cook and eat any meal.Very little noise from the neighbors on a quiet street. The only thing I would like better is if it was brighter, but being a basement apartment on a tree lined street probably makes all of Savannah less bright than I would like.The unit could use some TLC, but it is a 150 year old house, and clean with no odors that I could smell. We emailed LS for some un-important questions, and they got back to us promptly. We loved walking the whole neighborhood. Clary's is just a few blocks away, and across the street is Mirabelle's, which we walked down for coffee every morning. Our favorite attractions were the Bonaventure Cemetery with Bonaventure Don's tour. The green and orange trolley is very good for an overview, especially if you are a first-timer to Savannah. Behind Forsyth Park is a good BBQ restaurant...the Sandfly. We had an awesome time in savannah. First time there and we did all the tourist stuff. Our place was close to forsyth park and they had a special art show on saturday that made for a fun day. the property is in the basement and a little dark. Every morning we got up and thought it was rainy and cloudy only to walk outside and have it be sunny. Other than that, it worked out perfectly. Nice quiet neighborhood, and everything worked fine. You have to remember this is probably a house that is over 100 years old, so expect some quirks. Nicely furnished with comfortable king size bed. Felt like we were going home after a day exploring this wonderful city. Parking is on the street which was no issue at all. Everything went as planned planned which is unusual when all planning is done over the Internet. While in Savannah this will be where we will stay. Y'all will love this large apartment for 2. Thank you for choosing to stay with Lucky Savannah! We are so glad you found the home to be comfortable. This home is in a fantastic location, with ample parking, making it very convenient for our guests. We hope you all decide to stay with Lucky Savannah again! Please don't forget about our 10% "Returning Guest" discount. Travelled to accommodate an art class Kathy had on Skidaway Island. We had no prior experience with Savannah. Staff was helpful during selection process. The location was great, easy access to downtown and the island. Great free street parking was a real plus. Thank you for choosing to stay with Lucky Savannah! We are delighted you chose Gaston Garden Apartment for this special stay. 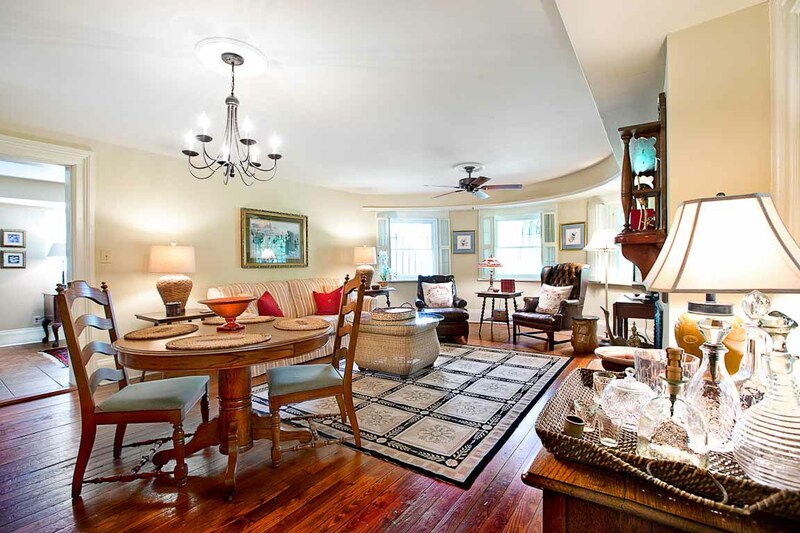 We try our hardest to find you a great home for your Savannah vacation! We hope to have you all again soon, and please don't forget about our 10% "Returning Guest" discount. We enjoyed our stay emencely!! The Carrage House was just the place for us. 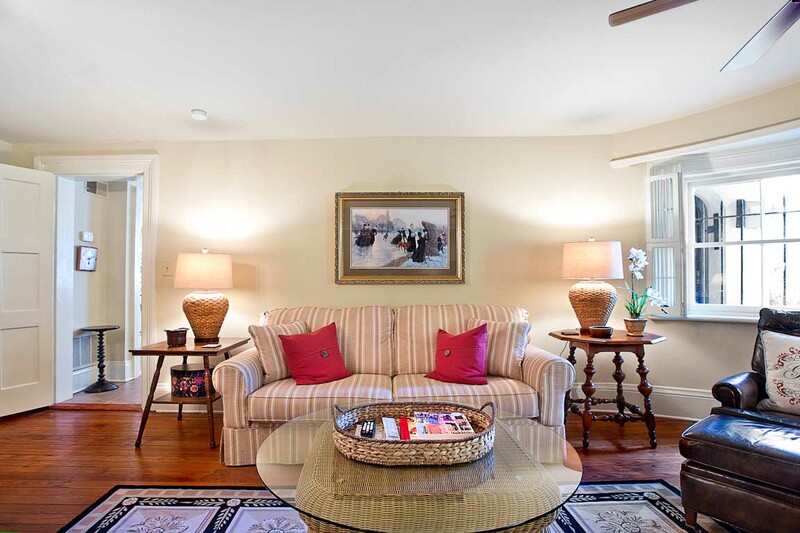 The central location was perfect With a quiet neighborhood surrounded by beautiful homes. Typical Savannah style! Gaston Street is a great location if you want to see Savannah by foot. The apt. is very comfortable and well stocked. We especially appreciated that Lucky Savannah immediately sent two internet professionals over when we called to say we were having internet issues. The only slight inconvenience we encountered was the towels never quite dried due to the humidity. A bathroom fan would help somewhat. But as there is a clothes dryer to use, it really wasn't a major problem. We would most definitely stay again if we return to Savannah. Thank you for choosing to stay with Lucky Savannah! Gaston Street really is a great place to start your adventure! We are so happy to hear you were pleased with the home. We thank you for bringing this to our attention as well, our team tries their hardest to make sure we take care of every situation! We hope you choose to stay with Lucky Savannah again, in the near future! My sister and I had a wonderful time on our recent trip to Savannah. Our Gaston Gdn. apt. was wonderful: very spacious, well-maintained,lovely furniture, well-equipped kitchen, close to grocer and the entire historic district. We had a small problem with the entry code but sorted it out with management, which was professional, friendly, and attentive. We toured several historic homes and Bonaventure Cemetery,took a ghost tour, lots of shopping!! Walked everywhere and would recommend the hop-on, hop-off bus for one day. Highly recommend Mrs. Wilkes' Dining Room for lunch and The Olde Pink House for a special dinner, plus The Public (great Happy Hour), on Bull St., the Gryphon Tea Room on Madison Square, and the Kayak Cafe on Broughton St.(the best pecan pie ever!). A fabulous trip, would definitely recommend the Gaston!! Thank you for choosing to stay with Lucky Savannah for your Savannah vacation! We thank you for the kind/honest review. Our team tries their hardest to make sure any situation during your stay is handled in a timely manner! We are so delighted to hear your sister and yourself enjoyed your time in Savannah. Gaston Garden Apartment is in a fantastic location, and we are so glad you all agree! We hope to have you as our guests again, in the near future. Please don't forget about our 10% "Returning Guest" discount! We so enjoyed our stay at the Gaston Garden apartment. It had all the luxuries of home at an affordable cost. I don't know why anyone would stay at a hotel when they could stay here! I would definitely stay here again. When we stayed, Savannah was in the midst of a cold snap, but when we arrived at the Gaston Street Apartment, the heat had been turned on and the lights, also. It was a very warm welcome, literally. To say that the unit was spacious would be an understatement. The bathroom was immaculate, water pressure was good, and the fragrance of the toiletries was inexplicably comforting. The hosts had attended to many details, such as providing flashlights useful for evening jogs in the park. Thank you for choosing to stay with Lucky Savannah! We have been having a cold front for awhile now, which can be refreshing for some of the southerners. We are so glad you arrived to a warm welcoming. We thank you for the kind/honest review, Gaston Garden Apartment is a great home! We hope to have you all as our guests in the near future. Very homey and comfortable. Great garden and seating area. Have been to Savannah, owned and rented and this is great. Kitchen is stocked with dishes, pots pans etc. Plenty of everything. Walking distance to everything. Shouldn't give such a good review, we might not be able to book next year. We came to Savannah for my husband to participate in the half marathon. Our rental was in the perfect spot. We walked everywhere - grocery store, several beautiful parks, down to the riverwalk, and all the shops and restaurants in between. The apartment was clean, spacious, and had everything we needed for a relaxing weekend. Thank you for choosing to stay at Gaston Garden Apartment! We are so glad you chose the perfect spot! Gaston Garden Apartment is very convenient to everything! We are so glad you enjoyed your stay here in Savannah. We hope to see you all again next year! We loved walking around the historic district. The fountain in the park was so close, our favorite spot. The apartment was very comfortable and we cooked in several times. My husband and I spent a long weekend here for our 1st anniversary. Everything about the apartment was wonderful! The location was perfect. We had an amazing experience in Savannah and would definitely stay at Gaston Garden again. Thank you for choosing to stay with Lucky Savannah! Congratulations on your 1st anniversary, we are so happy you shared this special time in one of our homes! We thank you for the kind/honest review. We hope to have you as our guests again in the near future. Please, don't forget about our 10% "Returning Guest" discount! Parking was a little stressful. Close to many of the must sees in the Historic District - a block from Forsyth Park, the Cathedral, and many that quaint shops, restaurants and bars. For those of you who are tall, be careful of the entrance. You will bang your head if you don't bend down. Thank you for choosing to stay with Lucky Savannah! Gaston Garden is fairly close to many great "Must-Sees" in Savannah. Being only a block away from the city's largest green space, Forsyth Park, is so convenient! We thank you for letting our future guests know about the step-down entrance. We will bring this to our homeowners attention, and possibly place a sign above. We used to live in Savannah and when we decided to return for a visit we knew that the location for our home base would be really important. And this was just right for being quiet enough, but close to the park and all that we wanted to get around to. Very clean and had what we needed for the weekend. Lucky Savannah was great, they were responsive and the app was easy to use. I also liked having a keycode front door, one less thing to lose. A few comments about the apartment, I was a little surprised by the light level because the photos show it as brighter than it is inside. Of course, it is a garden apartment, but it was darker than the photos showed, and the lens used for the photos makes it appear taller than it was in person. Bed was fine, but the pillows were were all stuffed full so there wasn't a good option for those of us who like soft pillows. Lastly - I didn't know how to get to our outside space, we loved the outdoor space in the photos, but I didn't know how to get to our space...or if it was ours since the side gate was locked. It didn't matter in the end - we ran out of time enjoying the city! Wonderful last minute trip to Savannah! Renting through Lucky Savannah was seamless and our rental was terrific! Thank you for choosing to stay with Lucky Savannah! We are happy to hear we were able to accommodate a last minute trip for you all. 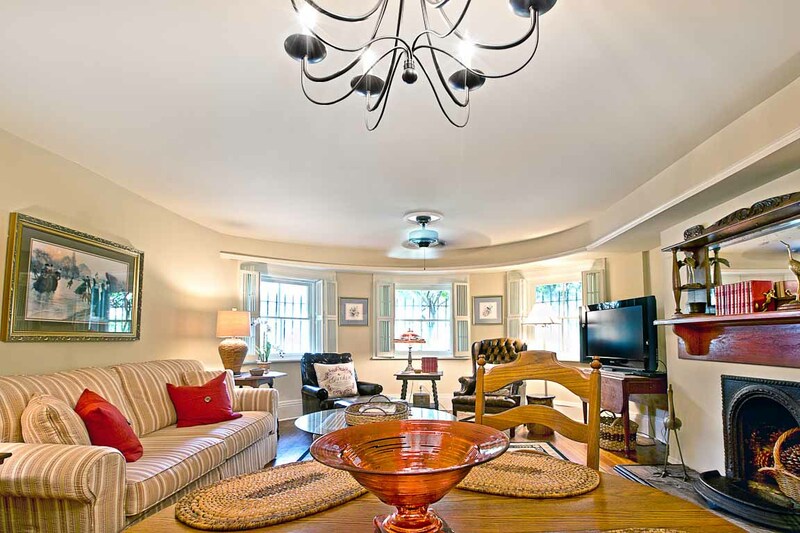 Savannah is a great place, and you chose a great home for a lovely stay! We hope to have you all again in the near future. This property was exactly as described. I would highly recommend this for a couple getaway or parents traveling with a small child. Great location to Forsyth Park and Old Town Trolly Tour Stop. Close parking options. Beautiful building and garden. The king bed and pillows were very comfortable. The bedroom was spacious. The bathroom was good enough, but not anything special. The toilet was not bolted well to the floor and could be moved with ease. This could pose an issue with sanitation eventually and does not bode well for the overall upkeep of this apartment. 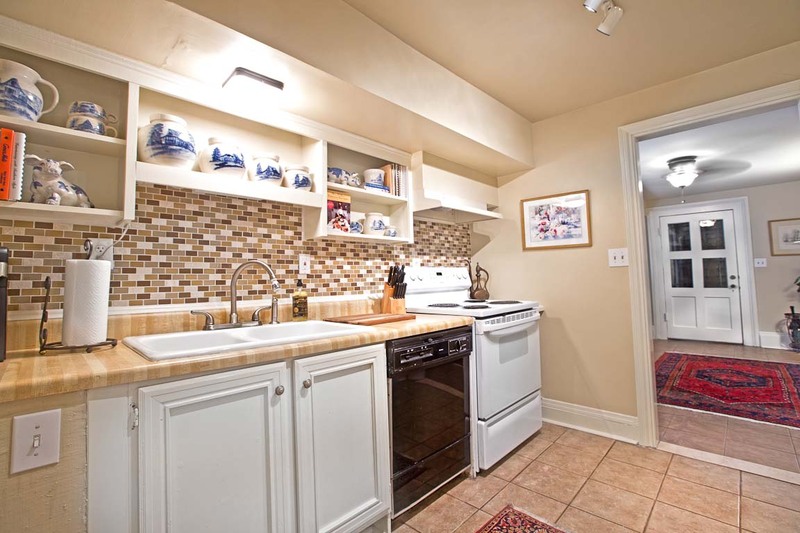 The kitchen was very useful and had all the conveniences of a short stay. The living room and dinning table were barely usable. The dinning table chandelier light was not working. From reading the guest book, it has been like that for some time. This makes for eating dark meals, not exactly what you expect. The living room furniture is all completely worn out. It seems to be pieced together from thrift stores. Everything is old and uncomfortable. The cushions are all flat and do not provide any support whatsoever. Certainly does not live up to the picture or equate to the value charged. TV is basic non HD cable. The check in check out process was very simple and efficient. The app was also very useful for the stay. Working with Lucky Savannah was a dream! The management team was so attentive and accommodating, shout out to Brooke who helped us when our travel plans changed! The location of our place was walking distance to everything, super clean, and beautifully decorated. You will not be disappointed when planning with Lucky Savannah! We enjoyed our stay at this apartment. It was clean, comfortable, and spacious with a nice living area, well-equipped kitchen, and comfortable bed and bath area. This part of town in quieter than the places we have stayed a few blocks over in the historic district. I especially liked that the bed was very comfortable. We would stay here again. Hi Sarah! Thank you so much again for choosing to stay with us. We're so glad to hear you enjoyed Gaston Garden and that the comfortable bed made your stay extra special. Looking forward to hosting you again soon! This has to be one of the nicest place I have ever stayed in. Great place, people were friendly, fell in love with city. Apartment was amazing can't wait to stay there again. Hi Joey! Thank you so much again for choosing to stay with us. We're so glad to hear you enjoyed Gaston Garden Apartment and look forward to hosting you again soon! This home was everything it said! First of all Lucky Savannah property management was the best to deal with! The home was in a great part of town. I'm very particular when it comes to where I stay. This home was spotless. The bed was so comfortable, could have stayed there all day! We will only rent through Lucky Savannah, we were very pleased! Hi Paige! Thank you so much again for choosing to stay with us. We're so glad to hear you had a wonderful stay and that our staff was helpful. We've heard great things about that bed and can't wait to host you again soon! Thank you for staying with us, Russell! Pros: good location, large apartment. Good supply of dishes, pans, etc in kitchen. Cons: Lock on the gate was difficult to open and I would never have opened it without help (a former employee on site by chance was able to assist). Light by front door was out on arrival and flashed continuously for 2 days. Maintenance person came but light failed again 2 hrs later. Lucky Savannah did not respond to maintenance requests sent via their app or via email. A running race in the neighborhood closed roads on day I had to go to the airport; it would have been helpful to have a 'heads up' on that. Kitchen had no cabinet to store non-refrigerated food and no staples (one packet of coffee but no sweetener or creamer, no spices, etc). Ice maker not working. Hi Michele! Thank you for spending your Spring break at Gaston Garden Apartment. See you next time! Our first time in Savannah. The Gaston Garden Apartment was ideally located, we walked everywhere! We enjoyed staying here, the apartment was comfortable and gave us plenty of room to relax and unwind. Hi Barbara! We're so glad to hear that Gaston Garden Apartment was charming and comfortable. Looking forward to hosting you again soon! 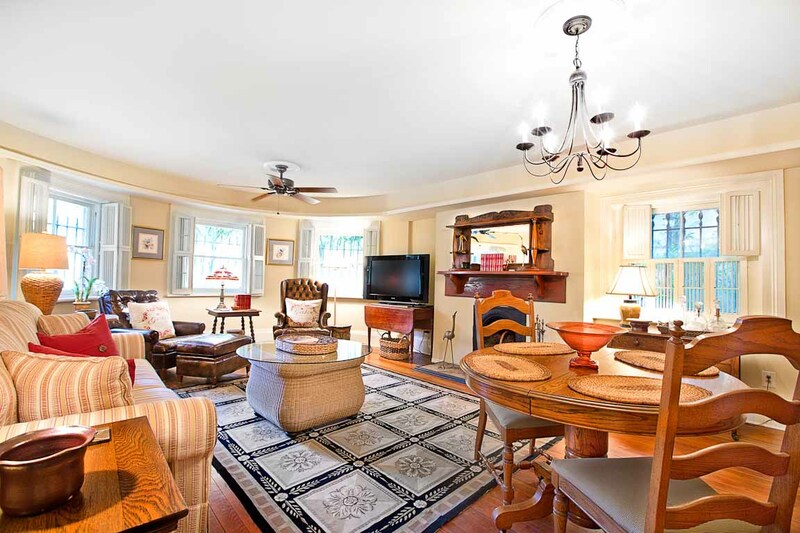 Location was excellent, easy to walk to everything in the historic district. 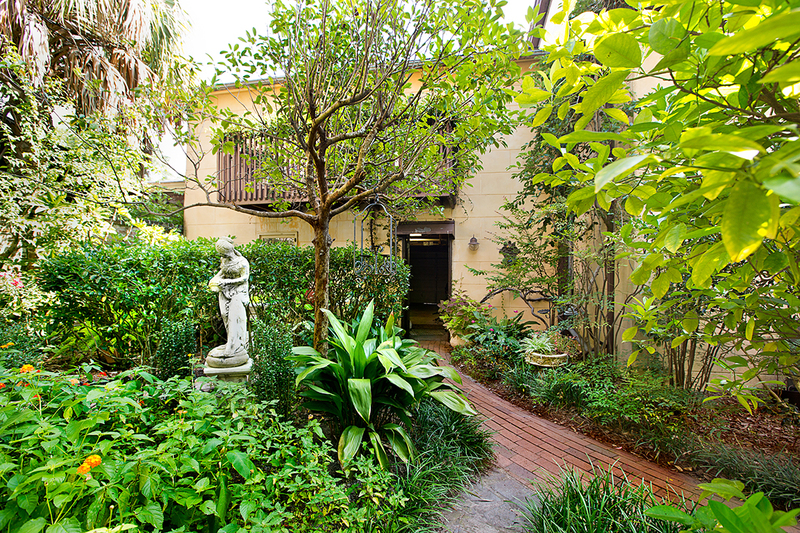 The courtyard garden in back was a great place to eat breakfast, see birds, enjoy the beautiful weather. The kitchen was well appointed--there was nothing we needed that wasn't there. If you plan on cooking, there was only pepper and salt there, so come prepared. WE had trouble trying to figure out how to turn the TV on--someone from Lucky Sav came over and re-set it. I would recommend instructions in the guest book telling which remotes did what and what channels had to be on to save themselves a trip. Wonderful place to stay for our honeymoon. We were able to walk and bike everywhere! Thank you for choosing to stay at Gaston Garden Apartment for your honeymoon, Kerry! Congratulations! Very cute, could use a few minor upgrades. VERY CUTE, great price, wonderful service, perfect location, felt safe, very clean.. The only things I think that could be improved are the smell of the apartment (it has kind of a musky smell). This could be something that is native to Savannah that I am just not used to. Don't let that scare you - it wasn't bad and we got used to it very quickly. It was just different at first. Also the bathroom does not have a fan to vent the steam from the shower.. again not a big deal just a small issue. Its in the historic district so we weren't expecting all the bells and whistles. Definitely an older apartment with "historic" vibes. Overall we had a fantastic trip and I would highly recommend this apartment and lucky Savannah. Hey Josh! Thanks again for staying with us at Gaston Garden Apartment. That "musty" smell you mention is definitely a characteristic of Savannah's old homes, and appreciate you recognizing it as such! We look forward to hosting you again soon. It was in the perfect location. Beautiful city, amazing weather and lovely garden apartment. Thank you for staying with us, Donna! We look forward to your return. My husband and I spent this past Christmas at Gaston Garden apartment. It is the perfect place to stay. 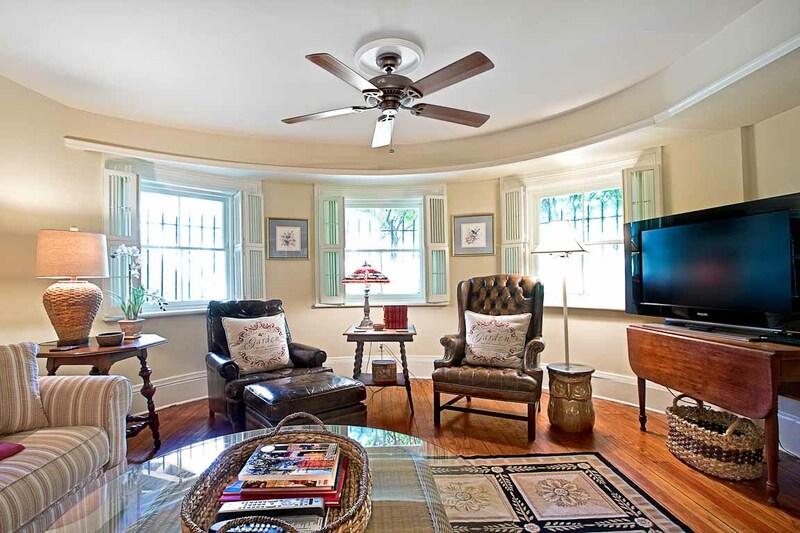 In the middle of the historic district,close to restaurants, parks, and all the sites of historic Savannah. It is quiet, tastefully and comfortably appointed. Lots of room with all the Amentities of home. We had the opportunity to meet the owners and they are delightful. Great rates, $129.00 on weekdaysm $139.00 on weekends. We had room for other family members to come over and gather in the large living room.Would highly recommend for any time of year!!!! The parking situation needs to be explained a little more in detail. It was a futher walk to River St. than I was told over the phone. My wife and I really liked our stay in Savannah. The apartment was the perfect home based. We walked everywhere (except for a couple of side trips) and enjoyed being so close to Forsyth Park. The on street parking was a breeze and free if you pay attention to the street signs. This was by far the best four nights of our two week vacation. Stayed from Jan. 2,2014 to April 2, 2015. Enjoyed every moment. The apartment was very comfortable and almost made you forget you were not in your own home with all of the comforts it had to offer. Great place to stay for a short visit or long term rental. Everyone associated with the apartment helped make it a carefree stay. Do it again in a second. 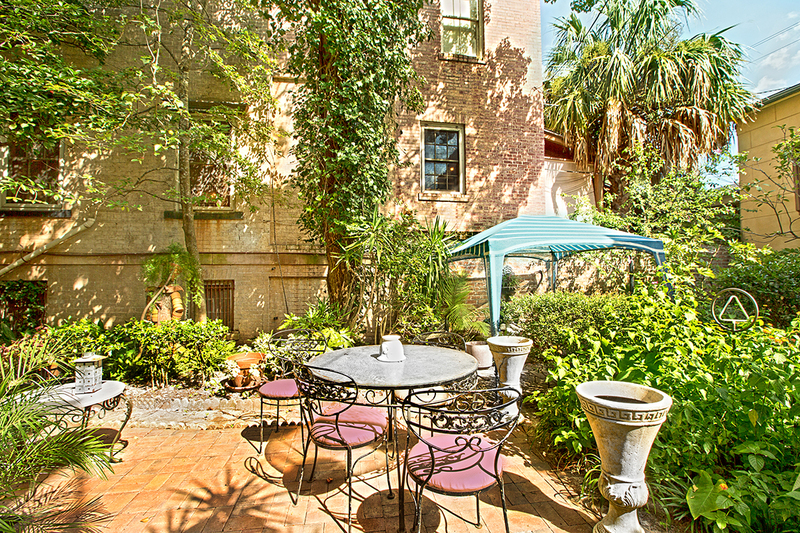 This amazing garden apartment is perfectly located in the historic district of Savannah. It is extremely comfortable with a king bed, complete kitchen, and living room. My wife and I were very comfortable and thoroughly enjoyed our stay in Savannah. Lucky Savannah is extremely easy to work with and very responsive to any needs. This apartment suited our needs perfectly. Quiet, charming, clean, and walk friendly to good restaurants, attractions, and riverfront. Street parking was no problem. We really enjoyed our time at this rental. The apartment made for a much more comfortable stay than a hotel room and was in a great location for exploring the historic district. Forsyth park is just around the corner and you can be on the riverside in 15 minutes. Would definitely return! My wife and I stayed for a weekend getaway. The property was very clean and well-decorated. The neighborhood was very quiet. 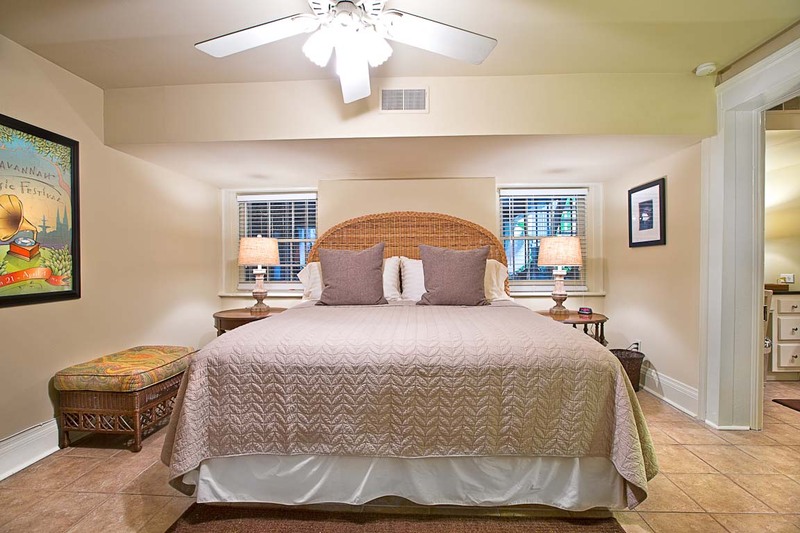 The apartment is located very close to Forsyth Park and about 1 mile from River Street. Please pay attention to the street signs about the street sweeping schedules. I got a parking ticket but it was completely my fault because I overlooked the sign. We did have a slight problem with retrieving the keys from the lockbox (mostly due to operator error) but after a call to the good folks at Lucky Savannah they were able to assist. We had a great stay in Savannah and really enjoyed the rental property. This was our first trip to Savannah and couldn't have had a better experience! We loved the Gaston Garden Apartment and all the amenities that made it feel like home. The city was beautiful and we can't wait to come back! What a perfect spot for a quiet getaway! We spent our days walking to the river front and made it to every square. Took advantage of the delicious food scene. Cotton and Rye, 11 Ten, The Olde Pink House and Collins Quarter were all excellent. Ended our evenings with a glass of wine at Forsyth Park just a block away. Perfect!